I never fail to be surprised; sometimes disappointed with bad news but, generally happy about something positive and unexpected. 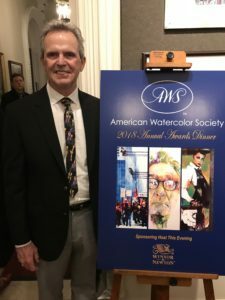 In this case, I was pleasantly surprised when I received notification that I had been accepted in the 2017 National Watercolor Society’s (NWS) member exhibit. The honor is all mine along with all of the other artists that are part of the exhibit. This just adds to the drama of the exhibition season that is now getting underway. 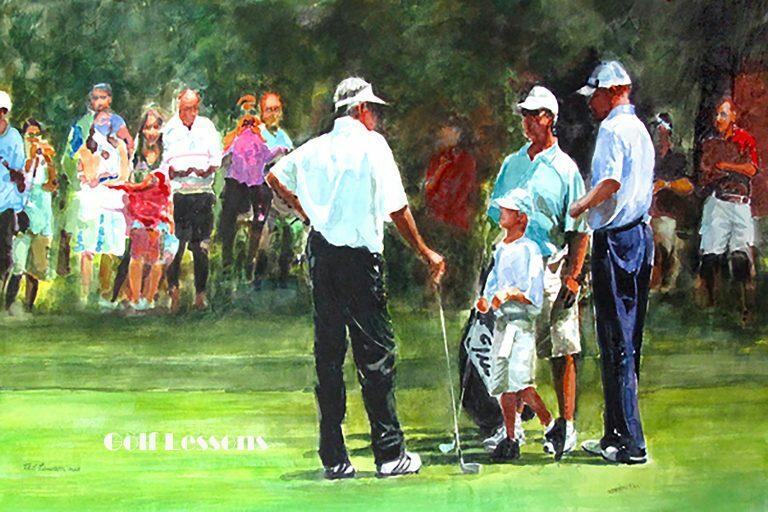 This honor is especially satisfying because of the painting (Golf Lessons) that was entered and accepted by the juror, Robert Burridge, a celebrated painter, teacher and publisher had not been accepted in two Stark County Ohio exhibits in 2016. The NWS member exhibit is open to members from all over the world. The list of artists accepted in this exhibit are from the United States, many states, and world countries including Malaysia, Italy, China, Australia, Scotland, Taiwan, Hong Kong. Judging competitions, near and far is a very subjective process. A friend once commented, “I never agree with any judge unless I win best of show.” Profound! My accepted painting shown below is one that I had a lot of confidence in because of the subject matter, composition and loose execution. Furthermore, the painting is a stand out example of my story telling approach that uses digital collage or in the illustration world, compositing. Firestone Country Club is the setting where recognizable golfers are being interviewed by a young fan while a nondescript crowd looks on. The golfers are from a 2005 tournament and the crowd is borrowed from one in 2011 . I was please with the result and Robert Burridge seems to be so too. Stay tuned for updates on the 2017 Exhibit Season.